The scenically attractive northern Free State hamlet of Memel is an undiscovered bird watcher’s paradise. Birding habitats include high altitude plateaus, the 27 kilometer long Seekoivlei wetlands, smaller wetland areas along the Klip River and numerous rocky outcrops, hillsides and cliffs harboring an abundance of birdlife. At over 2 000 meters above sea level, most of the surrounding land is used for grazing and consequently is ideal for bird watching. Expect to see various types of game. Amongst others, the area attracts Blue Crane, Crowned Crane, Blue Korhaan, Southern bald Ibis, Black Harrier, Burchell’s Courser, Eastern long-billed Lark, Rudd’s Lark, Botha’s Lark, Pink-billed Lark, Mountain Chat, Sentinel Rock Thrush and the Yellow-breasted Pipit. Look out for Grey-winged and Red–winged Francolin. During the wet season, set up a scope in front of the prefab house in order to see Waterfowl, Egrets, Herons, Crowned Cranes, Wattled Cranes and the petite Pale-crowned Cisticola. 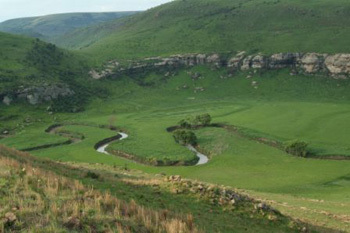 The Klip River features rocky hillsides, mist belt forest and wetlands which suit a number of bird species, including the Ground Woodpecker, Buff Streaked and Mountain Chats Sentinel Rock Thrush, African Rock Pipit, Bush Blackcap, African Rail and Ethiopian Snipe. Southern Bald Ibis can be seen foraging in the cultivated fields on either side of the road if one travels west from Memel, along the R 556 gravel road towards Verkykerskop. Widow birds should also be seen in droves. Over 600 km off road tracks, for adventure bikers,and mountain bike enthusiasts. If you are interested in the Anglo Boer War of 1899 – 1902, then the Orange Free State is well worth a visit. 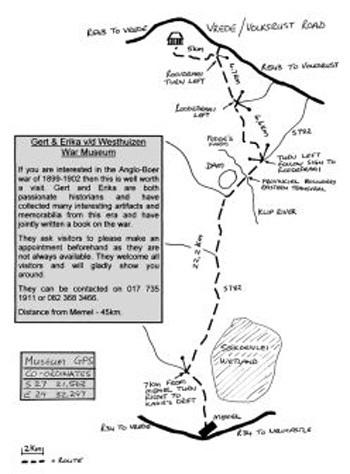 Gert & Erika Van Der Westhuizen are both passionate historians and have collected many interesting artefacts and memorabilia from this era and have just written a book on the war. They welcome all visitors and will gladly show you around but request that visitors please make an appointment beforehand as they are not always available. Allow approx 3 ½ to 5 hours for this scenic drive. Take the S781 at (1) S27 40 737 (E 29 35.306) zero odometer and travel for 7.3km’s until the “Y” junction (2) S27 43..901 (E29 38 822), keep left and travel towards Kranskop Mountain. At (3) S27 44 864 (E29 41.495) climb out your vehicle and view the hole through the mountain (18.3Km’s). 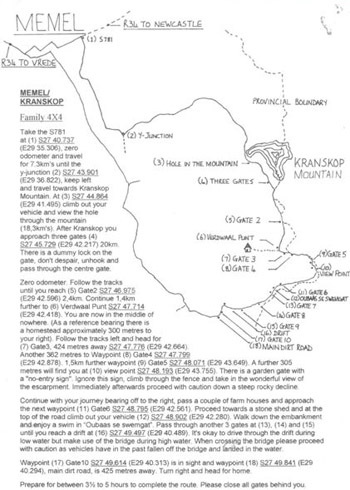 After Kranskop you approach three gates (4) S27 45.729 (E29 42 .217) 20Km. There is a dummy lock on the gate, don’t despair, unhook and pass through the centre gate. Please take care when driving through the drift which should only be attemped during low water as vehicles have been known to fall off the bridge landing in the water. 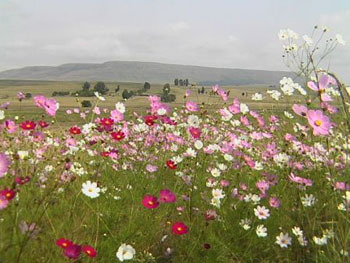 Native to Mexico and believed to have been introduced when the seeds were brought in with horse feed for British troops during the Anglo–Boer War, the Memel area is one of the best places in South Africa to view the sea of multi coloured, pastel Cosmos flowers. Gracing the road sides of Mpumalanga’s Highveld, Kwa-Zulu Natal’s Highlands and eastern and central Orange Free State, the Cosmos season lasts from late February to early May, although the flowers are at their peak in March and April. For a number of years now, Wakkerstroom has been the birder’s Mccca, as it is here that certain of the range-restricted grassland endemics and wetland “specials” are known to occur, and all are reasonably accessible. The area around the little north-eastern Free State hamlet of Memel can be just as productive bird-wise, and it is scenically very attractive. 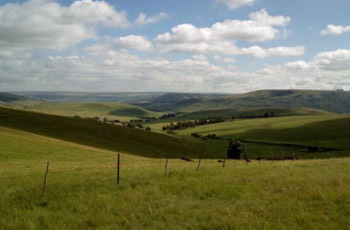 The main habitats for birding around Memel include the high-altitude plateau grasslands (mainly to the south of the town), the very extensive Seekoeivlei wetland (27 km long) immediately to the north, as well as other smaller wetland areas, particularly along the Klip River to the south (east) of the town. Rocky hillsides and cliffs are also to be found; these also harbour interesting birdlife. 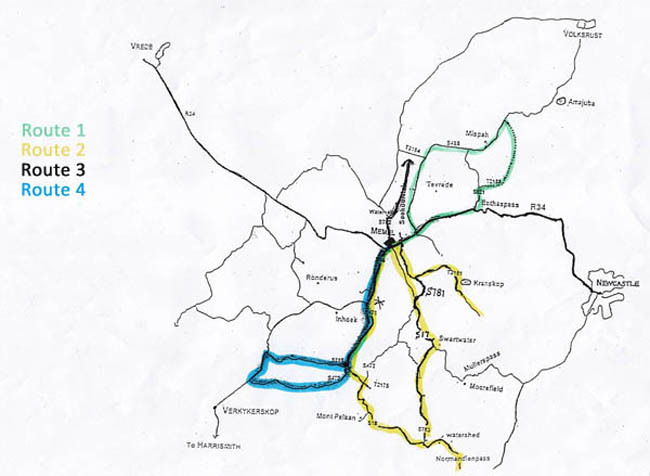 South to the high-altitude plateau grasslands, Normandien Pass and the Klip River Valley. 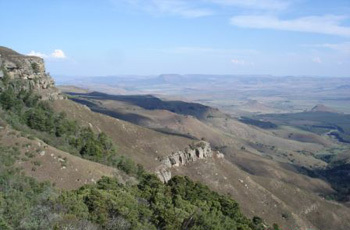 Extensive plateaus, characterised largely by rooigras ‘Themeda triandra’, are found to the south of Memel, and occur at an altitude above 2 000 m. Although some maize is grown on these plateaus, most of this area is used as grazing for livestock, and there are also small numbers of wild game species here, such as Blesbok. Interesting birds species occuring in these areas include Blue Crane, Crowned Crane, Blue Korhaan, Southern Bald Ibis, Black Harrier (usually in winter), Burchell’s Courser, Eastern Long-billed Lark, Rudd’s Lark, Botha’s Lark, Pink-billed Lark, Mountain Chat, Sentinel Rock Thrush and Yellow-Breasted Pipit. Rocky hillsides, mistbelt forest and wetlands in the Klip River valley also provide habitat for a number of bird species, including Ground Woodpecker, Buff-streaked Chat, Mountain Chat, Sentinel Rock Thrush, African Rock Pipit, Bush Blackcap, African rail and Ethiopean Snipe. 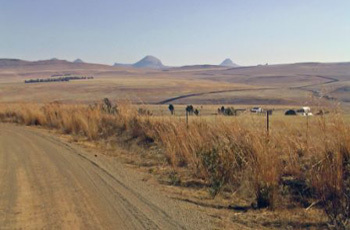 From Memel, travel south-west along the gravel road (S56) towards Verkykerskop. Look out for Southern Bald Ibis foraging in the cultivated lands on both sides of the road. Flocks of windows should also be present in good nurnbers here. Immediatley after a short strip of tar (steep downhill), turn left (S471) (the signpost is to Normandienpas/Mont Pelaan).